This article’s goal is to provide the residential homeowner with step by step cleaning procedures for cleaning terrazzo floors. 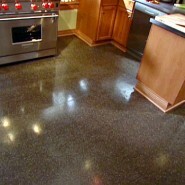 Also included in this discussion are the tools and products needed to clean terrazzo floors. These procedures are similar to cleaning terrazzo floors in a commercial building but without the use of commercial power cleaning machines. However as discussed in other articles there is some less expensive alternative power floor cleaning equipment that is designed for home use that will assist in the cleaning process such as a steam floor mop. Below are the daily or routine cleaning procedures for sealed terrazzo floors in a residence. The term “Sealed” for the purpose of this discussion means that the terrazzo floor has been coated with a top coating of floor finish or seal. If you are interested in cleaning terrazzo floors in a commercial building please refer to another article – click on this link for commercial cleaning procedures (Terrazzo Floor Cleaning – Daily Cleaning Procedures, Product and Tools). Generally speaking, residential cleaning terrazzo floors can be completed daily but maybe impractical. With that said, a residence’s terrazzo floors should be cleaned at least weekly and more often depending on soil conditions of the floor. Prepare a bucket with cool water and floor cleaner, diluted according to the label directions. A Neutral cleaner is preferred. Damp mop or wet mop the floor area with the mop until the floor area is covered. Hint: Always start in the furthest corner of the room being cleaned and work toward the opening of the room. This will prevent the person cleaning from being trapped in a room until the floor is dry.